Digital place- based advertising is about connecting you to the right audience at the right place, when this cares most about you. It’s about delivering targeted, accurate communications with no or as little competitive noise as possible. And because it’s digital, it also involves real-time, instant communications. In today’s difficult economic conditions, small businesses need to reinvent the way they communicate and advertise their products, with digital media increasingly becoming the media of choice. Efficient and impactful communication solutions are not to be found online only as people are not sat at their desks all the time. ‘Fish where the fishes are’’ the old saying goes. In other words, follow your customers. Yet, one must admit that social media networks and applications like Foursquare have enhanced the power of place-based advertising. By checking-in, consumers can receive discounts and have their loyalty towards a brand, a venue or a product rewarded. Being so cost-effective (or even free), companies of any size are implementing them to encourage customers or visitors to stop by and come back often. Displayed on an indoor screen, the technology is far more impactful. Show people who has checked in, who is the mayor and who ousted whom and you’re instantly reminding them to signal their presence, take advantage of promotions and indirectly, advertise your business for free on their social networks. Having your audience in your location is the ideal situation. You’ve not only got their physical presence but also their interest and attention in ‘’you’’ and what you have to say. Take advantage of this by prompting them to enquire, buy, visit a website, subscribe etc. No call-to-action will be stronger than one that can be followed through immediately. Businesses worldwide got this idea and modern communication platforms were thus put in place. A Swedish supermarket used digital signage (represented by an LCD installed near the entrance) to encourage customers to check-in via their smartphones and make prices fall. The more check-ins gathered, the lower the price of a retailer- chosen product. The initiative spread on social media networks, reaching a much wider audience than just the supermarket’s clients. ‘’Know Thy Customer’’ is the golden rule of marketing. Part of this in-depth understanding process involves knowing which are the spots your audience gravitates around ( apart from your location, of course) and what does it do while there. If you’ve completed this stage you are then able to adapt your communications accordingly. Spot the locations. These could be: nearby shops and offices or institutions like schools or local councils. Then target your audience there. Digital place-based advertising or communications are pointless if unrelated to the location and location- based interests of your audience. Generic messages to mass audiences are what television and newspapers are offering us for more than a century, we don’t need a new medium for doing just that. Think of your audience’s mind frame when in a particular place and build your message around it. The core message may very well stay the same across all these places, but the tone should be personalised to your target audience’s location at that moment. Networks of screens present the benefit of extending across locations. If you have a butcher shop, you might want to place an ad in the florist’s shop because that’s where your audience is to be found quite often. The florist might be interested in allowing you to display your ad because this would bring an extra- revenue for his/her business. Or if you sell cosmetics, you may want to get your message to a hairdresser’s shop, as you know its clients are likely to be interested in your offer. You probably won’t be very keen to approach the butcher for this service, though. Digital place-based advertising is not about reaching everybody, but about reaching the right persons at the right time, with the right message. It’s about being tactical and mobile and as nomad as the 21st century consumer is. Today’s technologies allow it. Cloud- computing and the decrease in LCD’s prices made digital signage (displays across locations) an affordable solution to businesses of all sizes that have something to say. Screens, unlike posters, can display a multitude of messages over a long period of time. Digital place- based media allows you to save on printing and manpower costs, as you don’t have to reprint ‘’the medium’’ when your message is outdated. All you have to do is re-upload it and then send in to remote displays in just a few mouse-clicks. To find out more about how and why digital place- based media could help your business, download our whitepaper- Digital Signage for Beginners. 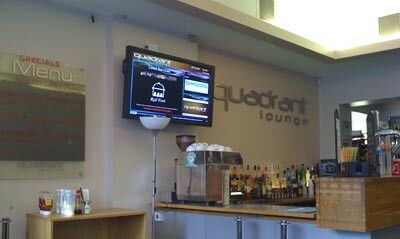 Or contact us today for a free consultation on the right digital signage solution for you. Click on the button below.